For a band that – for all intents and purposes – ceased operation in 1979, progressive rock giants Emerson, Lake & Palmer still get their share of attention. 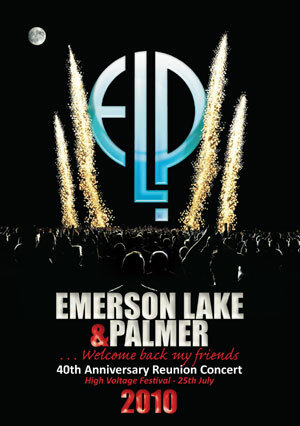 Save for a few years’ worth of albums and touring in the mid-1990s, the only post-seventies work from ELP was a one-off reunion in 2010 to celebrate the 40th anniversary of the group’s formation. 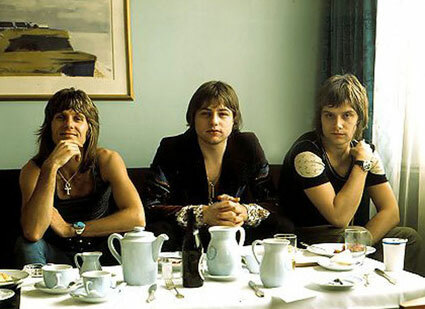 But the recent release of that show on DVD shows that – despite the inevitable aging process and the typical on-and-off relationships between the trio, as of 2010, Keith Emerson (keyboards), Greg Lake (guitars, basses, vocals) and Carl Palmer (percussion) could still convincingly – no, thrillingly – deliver the goods, both individually and collectively. From their earliest days together, it has almost always been so. A typically incendiary show from the band’s heyday has finally received legitimate, stand-alone release: Live at the Mar y Sol Festival ’72 documents the trio at the height of their powers. 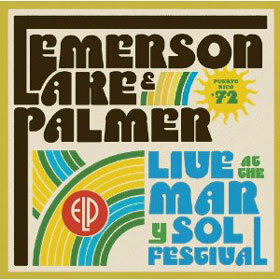 While soundboard recordings of ELP’s “Take a Pebble” and “Lucky Man” were included on a various-artists collection documenting the festival in Puerto Rico, the full ELP set had long been available only as a bootleg vinyl LP. One of the several box-sets on the group’s boutique label (Manticore) included the entire show, but December 2011 was the first time consumers could pick up the Mar y Sol performance as a single CD. Between the group’s breakup and reformation, and then again since, all three have remained very active. 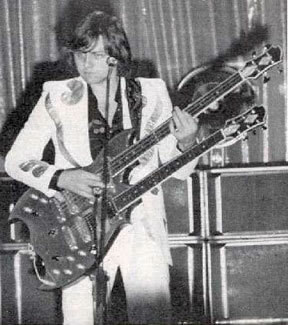 Emerson went in mostly for orchestral-type and soundtrack work; Palmer has busied himself primarily with Asia, and Greg Lake has – in addition to a stint as part of Ringo Starr‘s All-Starr lineup – mounted several well-received tours and a number of solo records. He was also involved in some “listening parties” and promotion surrounding the 2009 expanded reissue/remaster of the first landmark work with which he was involved, King Crimson‘s 1969 debut In the Court of the Crimson King. Even in light of all that activity, 2012 looks to be Greg Lake’s busiest year in some time. He’s putting the finishing touches on an autobiography, and he’s mounting a tour called “Songs of a Lifetime.” In the midst of planning for all of that, Greg took some time recently to talk with me about, well, anything and everything I asked him. We discussed his early days learning guitar; the polarizing effect ELP’s music has always had on music fans; the Rock and Roll Hall of Fame’s bias against progressive rock bands; and the upcoming book and tour. He was also kind and patient enough to tell the “Lucky Man” story for perhaps the thousandth time in his career. Consider this Parts One and Two of my ongoing conversation with Greg Lake; I’ll publish a post-show followup interview/feature in April. Bill Kopp: I’ve loved your music – especially your voice – since I was a kid. 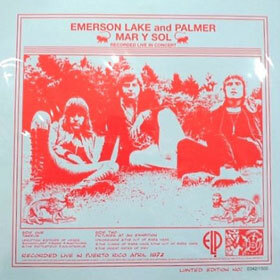 One thing that has always sort of puzzled me is the fact that Emerson, Lake & Palmer’s output so polarized people. There have always been those of us who’ve loved it, and on the other side there are people who dismiss it as overblown, pretentious…you know the sorts of things they say. There seems not to be any middle ground. And Rolling Stone – long since a useful arbiter of what’s good (if they ever were) – in the most recent hardcover edition of their Record Guide, they don’t even include an entry for ELP. And I think it goes without saying that ELP won’t ever be inducted into the Rock and Roll Hall of Fame. Jann Wenner hates progressive rock. So why do you think there’s such polarization? Greg Lake: I think there is some truth in the fact that ELP may have appeared at times to be pretentious. It depends, really, on your view. I think people tend to dismiss things they don’t understand. I think if someone listens to something like Pictures at an Exhibition, they assume – because they were probably brought up that way – that classical music is for the elite. And really, it’s not. Classical music was for the everyman. It was written for the public; it was just written at a different time in history. And, it’s less complicated than people would imagine. There’s nothing really complicated about Pictures at an Exhibition. However, if your view of classical music is that it’s for the elitist-type person — the intellectual, the them-what-knows – then you’ll probably be offended when someone like ELP tries to play some classical music. To us, though, it was just doing a great tune that we liked. With regard to…I don’t know who’s responsible for it, but I do know that the Rock and Roll Hall of Fame thus far does seem to have some sort of closed window on that whole genre of music. Which, for a museum [chuckles], is a very, very strange position to take. It is very biased. I’m certainly not going to go on a crusade about it, but it speaks more about the museum than it does about ELP. No one can deny that ELP sold in excess of twenty-five million albums; it’s played some concerts in the United States to as many as six hundred thousand people at a single event. Where is it that you can start ignoring things like that, pretending that it didn’t happen, pretending that ELP didn’t have an influence on a lot of American bands? ‘Cause it did, and I know it did. I get letters from them! People like the Red Hot Chili Peppers love ELP. This is the thing I find strange, to deny that strain of nutrient, that element of musical nutrition that came into America. It was a good influence; it made things more colorful. I think to deny it is really silly. It’s a part of reality. But I don’t lose sleep over it, and I don’t blame the American people for it; it’s got nothing to do with them. The good American public knows what they like. “Lucky Man” opened up the potential for people to solo in a different way. You can’t ignore that. Well [laughs] you can. But look, I understand that people like some things, and other things they don’t like. That’s quite all right; we’ve all got our own tastes. I actually met a guy the other day; he didn’t like the Beatles! I couldn’t believe it; I had to ask him, “Are you absolutely sure? You don’t like at least one of those two hundred songs?” I felt sorry for him, I truly do. I thought, “Look at all that beauty you’re missing.” But there’s none so strange as folk. BK: In case not absolutely everyone knows the “Lucky Man” story, do you mind recounting it? And it just happened to be that that day, they had delivered the Moog synthesizer into the studio. And so we said, “Let’s get that, all right?” And the solo is actually Keith experimenting with the Moog. The recording got captured when he wasn’t aware of it, so it’s completely unconscious. And it’s just him searching for this portamento effect, working out how long it takes to get from a low note to a high note. And it just happened to be that we recorded this experiment that he did as we played the track. And even then, we really thought it was just an album filler. We thought it would do, but nobody thought it was going to be a hit, or popular, or anything. It was a lovely thing, and it opened a door. It opened a door on a sound and a performance possibility. BK: If I recall from Sid Smith‘s King Crimson biography – I could be wrong on this – you either rehearsed it or even tinkered with “Lucky Man” in the studio with Crimson. GL: I can’t remember doing that. It is always possible. Because Robert [Fripp] and I went to the same guitar teacher. We learned the same lessons, and we grew up knowing the same guitar parts. I knew everything he knew; he knew everything I knew. Because we were both taught it by a man called Don Strike. He also, interestingly enough, taught Andy Summers. And you’ll hear a similar cross-picking technique in all three of those players. But I digress. Because Robert and I had grown up and practiced guitar together when we were young, we would forever be playing things from our past. Guitar lessons, stuff we wrote when we were younger. We would always have our little “party pieces” we would do. Not onstage, but offstage, in the hotel, wherever we were. Do you “LIKE” the writing here on Musoscribe? If you do, please consider nominating one or more of the reviews, essays or features on the 2012 BEST MUSIC WRITING ballot.